A few weeks ago we introduced you to Johnny, the first person to benefit from our Helping Heroes Fund. Johnny contends with a number of health challenges and after several bouts with pneumonia, he is required to be on oxygen 24 hours a day. You may remember that Johnny’s dad, Tom is deployed overseas. 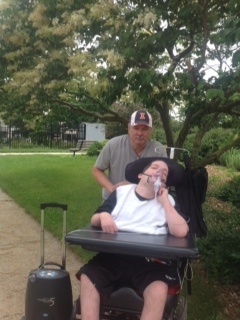 Tom’s commanding officer, Jerry, contacted us about getting a portable oxygen concentrator for Johnny so that he could go on outings with his friends at his care center, spend more time with his family, and get to his important medical appointments. On Memorial Day, American’s pause to remember those who gave their lives and those who make sacrifices every day to protect our freedom. Few of us can imagine what active duty soldiers and their families endure. And even fewer can imagine what it must be like to care for a child with serious health problems while worrying about a husband who is deployed fighting the war against terror in the Middle East. This is the everyday reality of SP4 Tom and his wife Julie who have a young son named Johnny. Johnny is just 16 years old with big brown eyes and close cropped brown hair, much like his dad’s military issue haircut.